Yuan Lu et al. describe here a novel diradical compound. Synthetic details: 2-mesitylmagnesium bromide Grignard reaction to dialdehyde 1, Friedel-Crafts reaction with boron trifluoride on diol 2 to hydrocarbon 3 and then deprotonation with lithium diisopropylamide to the dianion (green THF solution at -78°C) and then oxidation with iodine to the diradical product (orange-yellow 2-MeTHF solution at -78°C). Strategies that failed: direct oxidation by p-chloranil at RT resulted in a mess (but suggests the researchers were expecting a RT-stable diradical? ), same oxidation at -78° was too slow. n-Butyl lithium in the deprotonation step resulted in butyl groups added. ESR data of the successful reaction product suggest the diradical is predominantly a triplet species. It is persistent at -70°C for at least 24 hours, partly thanks to the two mesityl groups serving as kinetic shields. At room-temperature the diradical had rearranged to a 'dihydro compound' that was not investigated beyond mass spectroscopy. Two chemistry world records in rapid succession. Record one: a superbase as reported by Vadzar here. Superbases are nothing new, examples are TMG with an pKa of the conjugated acid of 17, phosphazene base tBuP1(pyrr) (20,2), triazabicyclodecene (21.7) and a guanidino-phosphazene hybrid with pKa 27. The new superbase is synthesised from an imidazolium salt and a guanidine with a record pKa of 28.4. The compound derives it's basicity from three factors: on protonation it has an aromatization gain, steric strain is relieved and as added bonus the sheer size of the base makes it easier for the positive charge to disperse. There is also news from the superacid front. Superacids are nothing new, examples are fluoroantimonic acid with an pKa of -25 and the carborane acid H(CHB11Cl11) (do mind that chemists love to confuse their audiences with different acidity definitions and that measurement rely on the collaboration of solvents and temperature windows). The people that brought you the carborane acid now moved on to H(CHB11F11) with chlorine replaced by fluorine (DOI). 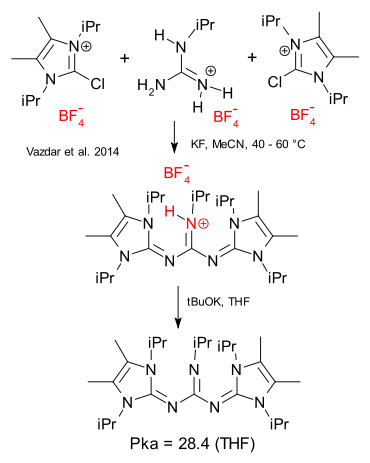 The compound was synthesised by reacting Cs(CHB11H11) first with hydrogen fluoride and then with 20 bar of fluorine gas, a procedure that was repeated 5 times. A practical procedure was difficult to establish because the reaction product as it turned out reacts with just about any hydrocarbon. The procedure is also not without risks to personal well being, the experimental info mentions "full-body protective clothing and the buddy system" which probably means that in the event of an explosion or gas leak two deaths will occur instead of just one. The compound reacts with benzene to a benzenium ion (like the chlorine counterpart) but it protonates just as easily n-hexane forming a carbocationic salt and hydrogen gas (unlike the chlorine counterpart). A previous episode of this blog reported on the synthesis of nanotubes starting from 12-cycloparaphenylene. In a very new bottom-up approach described here the starting material for a closely related nanoribbon is a slightly modified tetraphenylcyclopentadienone. Added functional group is an alkyne group and by polymerization at 250°C alkyne and cyclopentadienone combine in a Diels-Alder reaction to a polyphenylene. 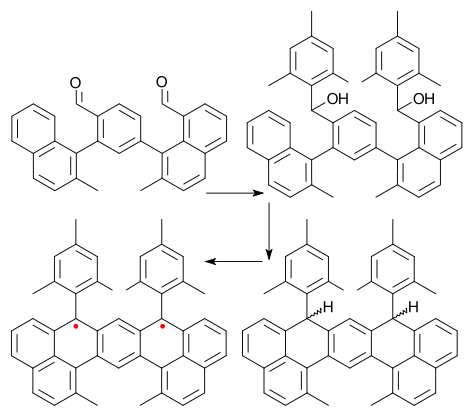 A second cyclodehydrogenation step (Scholl reaction) with ferric chloride in dichloromethane at rt for 3 days assembles the planar nanoribbons. The final dimensions of the nanoribbons have been reported as 1 by 200 nanometers and with hairs because the monomer has two dodecyl units stuck to it. These hairs enable the ribbons to disperse in an ordinary solvent such as THF.